Elements The Awakening slot machine from Net Ent has 5 reels and 20 paylines. As the name suggests the game takes back to the beginning of the universe when there were elements floating around in space that would eventually end up at us. The game’s jackpot is 1,500x line bet and there is a free spins bonus with 10 free spins. The complete details of the game are in the Elements The Awakening slot review below. For a modern twist on the classic “elementally-inspired” video slot, look no further than NetEnt’s Elements The Awakening slot – a five-reel, 20-payline title that boasts both collapsing reels and free spins. As you’d expect, the game is inspired by the natural energies of earth, fire, air and water, but in this particular slot, action takes place in an interesting space-age setting. Thankfully, the elements and their lower-value equivalents have provided the designers with enough material to create a completely unique line-up of icons, while a range of great bonus animations really bring things to life. Playable from as little as £0.20 per spin across all desktop, mobile and tablet devices, the collapsing reels used in the Elements The Awakening slot machine allows players to win again and again as they battle their way to a 1,500x base game jackpot. A wild symbol is also present throughout the base game to help them complete more payline combinations, thereby improving the odds of activating a large chain of wins. The fact that the collapsing reels are relatively easy to set in motion is actually hugely important to the gameplay of the Elements The Awakening slot, as it is through four successive wins that players will be able to active the game’s main feature. When this is achieved, players will be awarded 10 free games with a new wild representing one of the slot’s four main elements appearing on the reels throughout. Whether this wild denotes earth, fire, air or water will be decided by which quadrant is dominant on the bonus metre when the feature is activated, but each one offers a powerful modifier that will aid players in their quests for profits. Earth wilds appear on reels two, three and four and stay in place until a win is triggered, while air wilds are a randomly-placed pair that remain sticky for all free spins. Fire wilds again appear on reels two, three and four but also have the potential to spread to reels one and five if players are lucky, while water wilds may just be the best of the bunch given they can potentially turn any of the game’s central columns completely wild to create multiple payline combos. 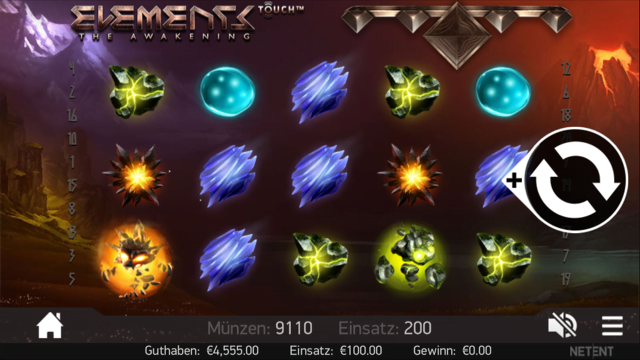 A graphically superb slot that features some of the best animations we’ve seen come out of the NetEnt slots studios, the Elements The Awakening slot is a real treat for the senses and offers a great level of playability. Like the Elements The Awakening slot review? Check out these as well…..